Buckingham Palace and Oxford Street and the two most visited spots in the city and every traveler should find time to check them out. The famous Abbey Crossing is also very popular among tourists and worth visiting. Go to one of the many Leicester Square restaurants and enjoy a lovely meal. 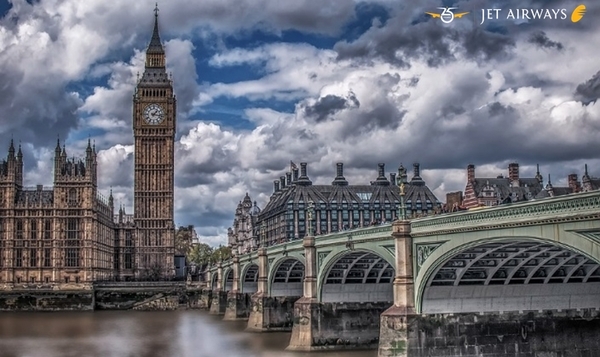 Visit the famous Tower Bridge and enjoy a beautiful panoramic view of the city. The giant Hyde Park is also one of the top locations, and travelers all around the world come here for a memorable experience. Fares are applicable on return journeys in Economy for travel between Mumbai and London on direct flights operated by Jet Airways. Fares are excluding Airport taxes and surcharge. Mumbai to London - Applicable on flight 9W 116. London to Mumbai - Applicable on flight 9W 115. Tickets must be purchased on or before May 31, 2018. Travel must commence on or before Jun 22, 2018. Child/infant discount, date change, flight change, refund charges, weekend surcharge, black out period, travel restriction and / or flight restriction will be applicable as mentioned in the fare rule.